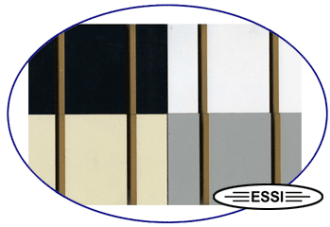 ESSI is a provider of standard finish, wood grain, and Wilsonart Slatwall Panels in Melamine, HPL, and Fomimca Coverings. 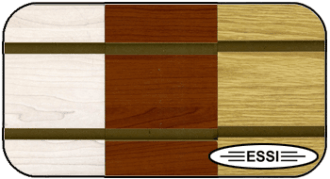 What is a Slatwall Panel? Typically one of the most overlooked sections when constructing a new store is the walls. Slatwall used as coverings for a wall can be most attractive as we have colors and patterns available that match other fixtures in the store. Let’s say you have the standard Almond/Beige colored gondolas, we have an almond colored panel that will match the color of your existing gondolas. One aspect of using Slatwall Panels to cover a wall is we have many accessories available to display or hang merchandise on. We have hooks, a unique sturdy shelving system, clothes hangers, hang rods, and more. A Slatwall Panel is made out of a pressboard sheet of plywood. Our manufacturing then takes the pressboard sheet, applies a hard durable attractive covering to the pressboard panel, and once the applied covering has cured the final process of cutting the grooves into the panel is performed. A standard Slatwall Panel is available in a 4′ high X 8′ wide sheet with grooves cut in at either a 3″ on center or a 6 “ on center configuration. A plastic or aluminum insert is also available to provide strength and durability to the panel for hanging displays. The most affordable covering is what is known as the Melimine covering. Mostly available in a Black, White, Gray, Brushed Aluminum, and Almond colors. We have many wood grain Melimine coverings also available. Many other coverings are: Formica, Veneer, HPL, Mirror, and Wilson Art coverings are available in most any pattern and colors for high end stores. Available in many different patterns and coverings to meet the needs of most any store application.